‘New Bond Street’ is a variation of our most popular design Bond Street style. A slightly different typeface, a pretty Sage Green ink and instead of Brilliant White card we use Hi White Wove, all new elements that we feel enhance this modern classic. The standard wedding invitation is printed in sage raised ink on plate sunk Heavy Weight (600gsm) High White Wove 6″ x 6″ single card, supplied with matching envelopes (unlined). The invitation can be adapted to your preferred style and you have the option to alter: size, ink colour, print style and font, plate sinking, card type, gilt edging, lined envelopes, add motif, ribbons or artwork to the design. 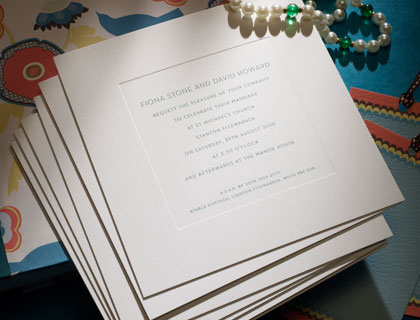 Could we please have pricing for wedding invitations, envelopes and additional information card for 35 invitations from the New York, New Bond st and Pimlico ranges? My fiancé and I think your website looks great. 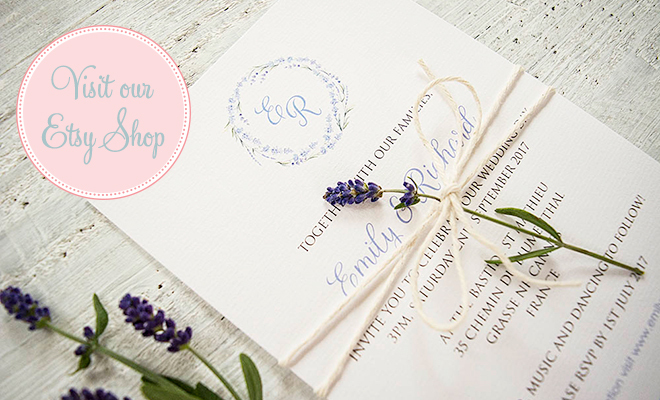 We are looking at sourcing someone who can do arranged wedding stationary, including invites/order of service/menus, I thought perhaps we can have a discussion about design and getting this commissioned. What’s the best way to se this up?